A few weeks as they say in politics is a lifetime and since I read this at the turn of the year this book has probably more meaning than it did two weeks ago .Boualem Sansal is a writer that talks about the uncertain world we live in his books are frequently banned in his homeland, I have reviewed him before with his book Harraga , this book is set in a distant future and is a reworking in a way of Orwell’s book 1984. The reasons for these restrictions are not known. They date from long ago. The truth is that the question had never occurred to anyone, harmony had reigned for so long that no one knew of any reason for disquiet .Even disease and death, which took their turn more often than was fair, had no effect on people’s moral. Yolah is great and Abi is his faithful delegate. This is what happens when one man takes power to far the rest forget why the rules were put down in the first place . Ati lives in a future where his country Abistan is a totaliranian regieme the coutry is named after its leader Abi a man that found and was given a new book to live by from a new god Yolah . The new religion is of course a twisted version of Islam we see beheading , stoning of the criminals as examples to the nation. As they have to pray nine times a day . Now he happens to meet an archeologist that says he has discovered some truths in the caves about the village they have found Nas tells Ati about this but this discovery could threaten the regime that wants to control the lives of the citizens by watching the every move like in 1984 . Can ATi and his friend Koa get to the village and discover the real truth behind Yolah and Abi ? Before they are caught by the regime ! Ati nearly falls for a quiet life of being blind to the truths around him that he knows are their . Well how strange the book has so many echoes of what is happening now this is of course the other end of Trumps world a state that has taken an extreme version of Islam that seems very similar to the language of Trumps world . Even the fact the village means the history is different to the History Abi is trying to give other since I read the book I am reminded of the Alternative Facts quote from the Trump camp. This is a timely novel as much as 1984 is seen to have much in common with Trump this take on 1984 is maybe more scary as this is partly Trump but maybe what could happen if the regimes Trump has just kicked by banning their citizens take another path could become Abistan. I can see why this book made a lot of book prize shortlist in France it is maybe better than Houellbecq book that every one was talking about last year . A powerful book against totalitarianism in all its forms whether eastern or western! Every year there is a few books in translation that seem to break free of being just in the circle of fans of translated fiction well last year this was one of those books, it made a lot of the end of year lists.It is also the winner of three prize in France. All this from a book that is based in an older book by the French writer Albert Camus for what kamel Daoud has done is taken part of the story from the novel the Outsider where Meursault the anti-hero of The outsider kills an Arab(that is all we are told even thou this killing is mention as the main character in the book say 26 times the person killed is never mentioned just refered to as the Arab) .Well this is the story of The Arab as told 70 years later by his brother . I’ll tell you this up front: The other dead man, the murder victim, was my brother. there is nothing left of him only me, Left ti speak in his place, sitting in this bar, waiting for condolences no one’s ever going to offer. Laugh if you want, but this is more or less my mission: I peddle offstage silence , trying to sell my story while theater empties out. As a matter of fact, that’s the reason why I’ve learned to speak this language, and to write it too so I can speak in place or a dead man, ao I can finish his sentences for him.The murder got famous, and his story’s to well written for me to get any ideas about imitating him. Harum in the bar talking about his brother the dead Arab from the Novel The outsider. This is the story of Harum , who tries to describe what happened 70 years earlier in the events that lead to the death of his Brother Musa, that killing on a sunny beach in an act of random killing by a French man on a sunny day in Algeria seventy years ago as the country tried to break free of France. But the story follows harun life after that event as he starts to tell the wider story of post colonialism and in some ways the rise of islam in his country all this is a strange mirror to events that happened in recent years with the Arab spring seen as a freeing of the Arab world, which maybe it is could Daoud have written this book twenty years ago ? But also the heart of this is what has happen in France in the last years with a number of the people involved in the attacks having connection to north africa . A timely story of what scars remain from France’s time in North africa , well any western nation it could easily be india or pakistan the story could have come from a kipling story say . Camus book doesn’t mention Musa name just calls him an Arab in the novel The outisder . What Daoud has brilliantly done is taken a small character in a well-known book and given him a real life and a name. I reviewed The secret history of Costaguana by Juan Gabriel Vasquez , which took a character from the great Latin american novel of Conrad Nostromo and told his story from a native point of view rather like this book flipping the story to tell it from the other angle almost like a reply to the first book . why was Musa just called the Arab was he just the same as those bit part actors in the original Star trek given a red tunic and expected to die with no real name or back story.Daoud highlights what Camus missed the real person. This is the first of a number of books from last year I will be reviewing in the coming weeks as I look forward to the first longlist in the new man booker international coming in March as I try to wrap up some books i missed from the last year. Have you read any great books based on another novel to start with? Well I had hope to get this book last week as it is one I feel we all need to read .Boualem Sansal had a government job in the early 2000’s til he start complaining about the government , his books since then have been critical of Algeria in particular how the vast money made from Oil is being spent and in this book womans rights .Boualem Sansal still lives in Algeria as he says the his country needs artists to pave the way to peace and democracy .He has won many awards and written six novels .He is one of the strongest critics of his country’s regime . This is how a whirlwind sweeps into your life .Nothing absolutely nothing in my past led me to suppose that one day i would open my door , open my life to such mayhem .I opened the door because that’s hat you do when someone knocks , you answer . Lamia just after Cherifka arrives at her door and the effect she has on her life . 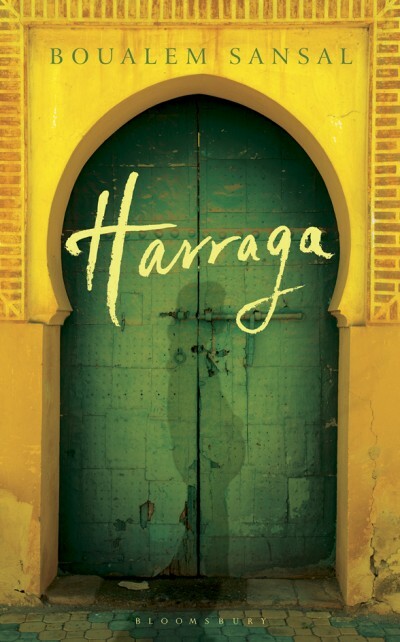 Harraga is the story of two women , Lamia , who up to now had lived a quiet life behind the wall of her house , just living in her own world and Cherifika a 16-year-old unmarried pregnant girl arrives in the middle of the night at Lamia ‘s door , she was sent to her by Lamia brother Sofiane .Sofiane is also the inspiration for the title the only member of Lamia family left alive he is a Hararaga , some one trying to escape Algeria for Spain across the sea .Meanwhile the two worlds of Lamia nad Cerifka start to clash , Sherifka is having to lay low but is struggling to do this in a way she is a new woman wanting to be equal wanting to be heard but this is dangerous for a girl with child that is unmarried could be killed for Honour .This is what Lamia is trying to do ,whilst seeing the world anew through this young girls eyes making this meek woman who maybe is an example of what woman have been in Algeria she gets stronger .As the two woman adjust to each other and the world outside . Cherifka is bored .I’ve noticed that she’s become less voluble , less frivolous , she is brooding , preoccupied serious .I scarcely recognised her .She is like a caged bird that has forgotten how to sing , to splash in its bath , to hop and skip for joy – a joy it can scarcely remember , one too distant and to fleeting to gladden the heart . Lamia sees how being held up in the house is affecting Cherifka , these lines remind me of the lines of Maya Angelou in a way . This is in some ways a classic odd couple story , the pair Lamia and Cherifka in some ways to me reflect the two faces of woman in the modern Arab world Lamia has hidden herself and in her own way is a romantic living behind a wall in her own world with ghost but not really living as she has settle for the life she has .Cherifka is the modern girl wanting to live , having a boy before being married , wanting to be seen and heard in a world where woman should really be meek like Lamia .Boualem Sansal has lifted the veil on being a woman in Algeria , but not just that through Sofiane and his trying to leave Algeria he has shown the problems in the country a country rich in its own world with oil money but only for the few .Then there is the house and the city t,the house has itself been part of Algeria and its history and through these two woman is seeing another turn in the country’s history .I know Frank the translator really hopes this book gets a wider readership because its writer has a voice that needs to be heard , silenced in his own country even here this book hasn’t really got the coverage a work of its quality and insight needs . Have you a favourite book from Algeria ? Assia Djebar name has flown high in the nobel odds the last couple of years so I decided to try her ,before she does win it .Assia Djebar is her pen name her real name being Fatima-Zohar Imalayen ,she is a Algerian of Berber origins , she was the first Algerian women to go the prestigious ENS the elite Parisian college .Her first book was published in 1957 ,she was also the first Maghreb to be voted on to the Académie française and won the Neustadt prize .I must say given all that she is still not well-known in the english speaking world and really should be . This collection the first of two books I got by her from the library is a collection of short stories and a 80 page novella Felicie’s body ,I ll leave the stories mainly set in Algeria and all dealing with a female perspective on what it is to be a women in modern Algeria ,Felicie’s body deals with a women near the end of her life and indeed after her death she is french catholic and was married for her life to her Algerian husband who died before her now nearing the end of her life we see her having to take a muslim name to be buried beside her beloved husband this story really catches what it is to be between two worlds as this family is some of her children drawn to Algeria other to France we see how this family copes with her death of the mother and her wishes to be buried beside her husband in Algeria . You arrive on a Monday morning in February ,unconscious already.In the ambulance ,I sit down next to my sister Ourdia ,who’s come with you from Oran .I tell myself this time you’ve come to die by my side ,right under my eyes .But will you at least look at me ,just once ? Smile at me ,maybe talk ? The opening of Felicie’s body . I write like many other Algerian women with a sense of urgency against regression and misogyny . That sums up so well how this book grabbed me and her as a writer feisty and lots of strong female characters .I asked my self is this a potential nobel winner having read other Nobel winners work and the answers is yes and I hope she does so her work can reach a wider audiences of readers .Her’s is a voice that lifts the lid on the female Muslim world of north africa and also how these women or there families are effected in France .The translation works a treat her the translator is new to me but has done a great job here .The book was published in the US by seven stories press in 2006 and the original stories were published in French in 1997 . Have you read her works ? Have you a favourite North African writer ?